Social psychologist James Waller uncovers the internal and external factors that can lead ordinary people to commit extraordinary acts of evil. Waller offers a sophisticated and comprehensive psychological view of how anyone can potentially participate in heinous crimes against humanity. He outlines the evolutionary forces that shape human nature, the individual dispositions that are more likely to engage in acts of evil, and the context of cruelty in which these extraordinary acts can emerge. Eyewitness accounts are presented at the end of each chapter. 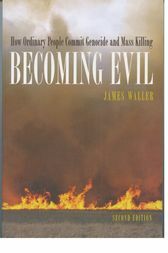 In this second edition, Waller has revised and updated eyewitness accounts and substantially reworked Part II of the book, removing the chapter about human nature and evolutionary adaptations, and instead using this evolutionary perspective as a base for his entire model of human evil.